View More In Bunting Bags. 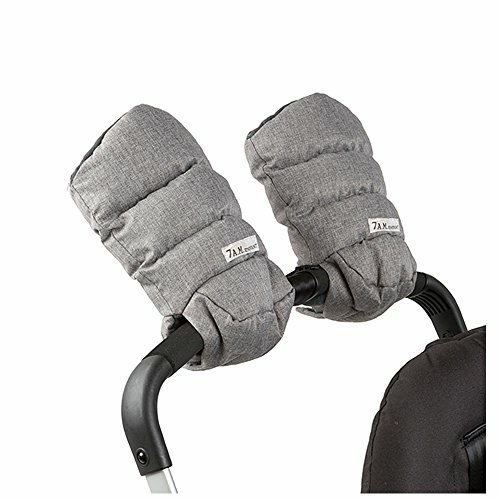 Calling all parents who’ve lost a glove on a cold winter walk—while juggling a stroller and a fussy baby. Warmmuffs make “runaway mittens” a thing of the past. They’re cozy and durable, with a water repellent outer shell, poly insulation, and a super soft microfleece-lined interior. But what makes them really special is the ingenious design, which attaches right to your stroller handle. Just slip your hands in and go to stay toasty on even the coldest winter strolls. When baby needs something, slide your hands out, do what you need to do, and go on your way. Featuring our Heather Grey material’s weave structure, inspired by the understated beauty of a staple textile in the home décor industry. This product is certified Cruelty Free and Vegan. If you have any questions about this product by 7A.M. Enfant, contact us by completing and submitting the form below. If you are looking for a specif part number, please include it with your message.